I'm doing the most amazing thing, I'm honoring my mission! That mission is to offer people simple, safe and empowering solutions for a healthy mind body sprit by teaching about the benefits of dōTERRA Essential Oils, Holy Fire Reiki, Crystal Healing and the AromaTouch Technique. It's totally changed my life and I love it, and I would love to share with you. When it comes to your health and the health of your loved ones, I know that you only want the very best. With dōTERRA, you'll know that is exactly what you are receiving. Whether you're applying essential oils topically, enjoying the aromatic benefits through diffusing, or taking essential oils internally, the positive, healthful effects are boundless. 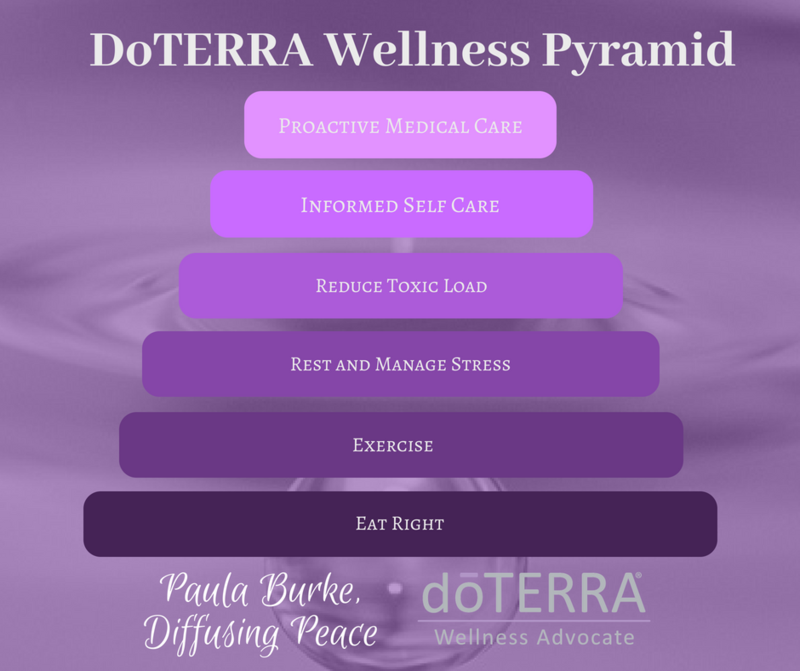 DōTERRA's wellness lifestyle pyramid illustrates how wellness is a combination of lifestyle and healthcare. When lifestyle is the focus, health is naturally achieved and maintained. As you live the principles of the wellness pyramid and use dōTERRA's powerful products, you will experience new levels of wholeness. "It all started with a sample of DoTerra lavender Paula gave me to try. Though I wanted to purchase wholesale, Paula carefully explained the benefits of membership letting me make the decision with all the information. When I was ready, she helped me with my starter oil kit and membership, later with understanding LRP, and now with the exciting launch of my business. Paula has allowed me to grow in this process at my own pace, sharing her knowledge of the product and business all along the way. And it all started with a sample." I am not a doctor. This information is what I found in my personal research. You are responsible for what you decide to do with it. This information has not been evaluated by the FDA. It is not intended to diagnose, treat, cure or prevent disease. Please seek medical treatment when necessary.